I wanna tell you a story today. A story of loss, frustration, disgust, and one that might possibly make you look at us differently--like we're total slobs living in a dump of a house. Possibly. I'll let you determine that last one. Let me back up...I love my kitchen. I better, since I'm the one who designed it, right? 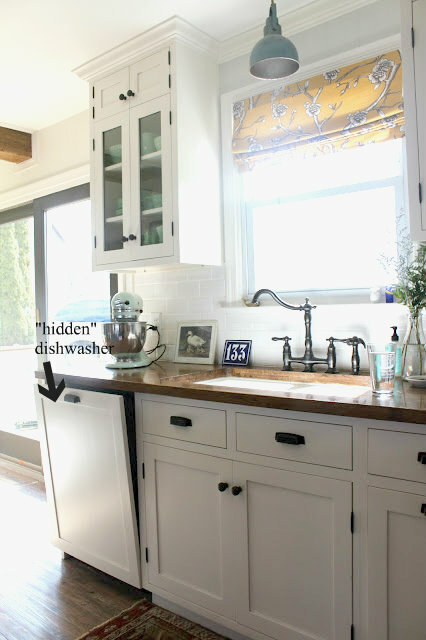 One thing I really love about my kitchen is that the appliances are "hidden." When we had our cabinetmaker make our cabinets, he also made panels for our fridge and dishwasher and we bought specific appliances that were made for panels to be put on them. I think it makes for a seamless-looking kitchen and since our kitchen is on the small side, I wanted everything to blend in together. That, and I didn't want to have to wipe down 17 million smudge marks a day, had we gone the stainless route. So I used to have a dishwasher. Clarification: I used to have a dishwasher that worked. (I do still technically have one.) And it worked like a charm. Loved it. Having a dishwasher for the first time in our house was amazing. Instead of scrubbing everything by hand, just stick it in that amazing box and...well I suppose you all know how a dishwasher works. Do you see that tiny little mouse trap in there? Yeah, we were going to be needing something a little bit bigger than that thing. I could tell Mitch didn't really believe me when I told him that "there's no way a mouse is making that noise." Well he soon found out. One night, as he was sitting on the couch in the living room watching TV, he heard a sound and looked over and there IN OUR KITCHEN, was a RAT. That's right--a disease-ridden, disgustingly huge rat. They both looked at each other (Mitch and the rat) with shock in their eyes--the rat, in total disbelief that he had finally chewed through that hole in the wall and had entered the promised land, and Mitch, shocked that I indeed was right the entire time. Mitch told me later that he didn't know what to do. He totally froze in disbelief. He COULDN'T BELIEVE that there was a rat in our house. Finally when he snapped out of it and decided that he should probably do something about this giant rodent, the rat also figured he better do something as well, so back into the hole in the wall he went. Mitch decided not to tell me about the adventures of that evening. He knew I would be out of my mind had I known. And there's nothing much more worse than a pregnant lady out of her mind, I mean really. Mitch and his dad were frantically trying to catch themselves a rat. 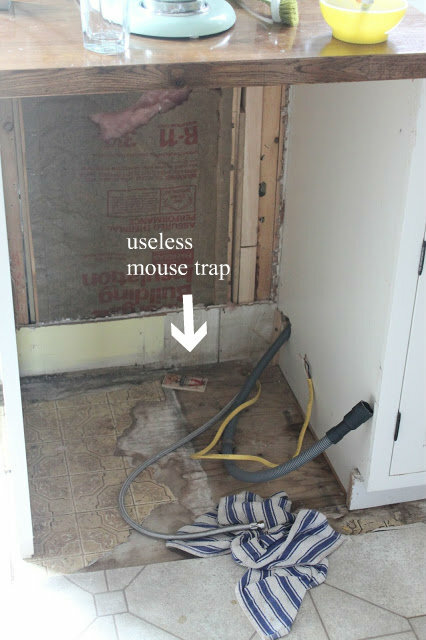 They bought several of those huge rat traps (that make me cringe just looking at) but didn't nab the rat. Then Finn and I came home from the hospital. What a joyous day! I didn't have the best experience in the hospital (especially the last night there...don't even get me started) so I was excited about being back in my own bed. We were home literally one day and the next day the whole family went out to vote (it was Election Day). When we came home, I was the first one in the house and was holding Finn. I rounded the corner of our entryway and right there standing on our kitchen floor like he owned the place was that disgusting rat staring right at me. Of course I screamed and ran out of the house and he scurried away somewhere. Didn't know where. This whole time our dishwasher had been pulled out and was setting next to our dining table. Well we found out later that evening that the rat scurried under the dishwasher, which again, WAS SETTING OUT IN OUR HOUSE. Mitch searched the house thoroughly and didn't find the rat so we figured he must have squeezed out a hole somewhere. Nope. Wrong. After we put the boys to bed that evening, we sat down on the couch to enjoy a leisurely few hours of TV watching, and Mitch heard a squeak. (Gross!) He pursued the sound and caught sight of a long tail and fur peeking out from under our dishwasher (gross, gross, gross). He looked at me with eyes that said, "What do I do now?" Well I told him exactly what he was going to do. I'll move the dishwasher and you get the rat with your hockey stick, was Mitch's dad's input. Ugh...so after some careful maneuvering and several slap shots later, the rat was finally taken care of. So...do you think we're complete slobs since we had a rat living in our house? You can be honest. I can take it. I still can't believe it. I CAN'T BELIEVE that that rat was hiding under the dishwasher that was right next to where we all sat down to eat our dinner that night! Oh my gosh...that's so disturbing. I was so worried that the rat had some friends nearby but we haven't seen or heard a rat since...THANK GOODNESS. Have you ever had a rat in your house? What did you do to get rid of it? Never was I more proud and thankful of Mitch's puck-handling skills than that night. Just a clarification: the rat chewed through the electric wiring under the dishwasher. The pipes I fixed, its the little wires that are hard to fix and are failing. Stupid rat! So sorry to hear about the rat in your house!! We used to get mice (yes plural) in my parents house growing up. And once there was a bat that made it down the chimney. We didn't discover him until all the lights were out and my brother and I were "safely" tucked up in our beds and suddenly I felt a whooshing sound right by my cheek! I was outta that bed so fast. I was an hour or so before my dad caught that thing! Yeah...that would be totally freaky having a bat near your face. I'm getting goosebumps just thinking about it! Yikes!! Those things are so creepy! We've never had to deal with one face to face, thankfully, but I've heard some little critter in our walls/ceiling before. We're in an apartment so thankfully it's someone else's problem to fix! However, in the past at a different apartment we had a few scorpions, some little baby lizards and an EIGHT INCH CENTIPEDE!!!! Seriously, look up a red headed centipede. You'll never want to visit Texas!! Crossing my fingers you don't have any more unwelcome guests! Oh my word...I think I would die if I spotted one of those centipedes. Even the tiniest ones TOTALLY freak me out! That is one time when I will scream for Mitch--when I see one of those disgusting things. Thanks for confirming that I belong in PA...rats and all. OH MY GOSH!!! I really hate rats, mice, possums........we have them all here. WELL not in our house. My mother in law read in a Heloise Helpful Hints book, years ago, that moth balls will keep rodents away. The house we were moving in to, had been famous for having rats in the kitchen drawers. UGH!!! In a metal or plastic coffee can, put a box of mothballs. I fill the can about half full or even more. Mothballs are cheap *you can even buy them at Dollar Tree. * Then turn the can upside down and poke holes in the bottom, *make sure to have the holes in the bottom for a metal can. Then turn upside down, with the plastic lid touching the ground. * I have my husband put a couple of these cans under our house. If you have a large home, use more then two cans. Our home is only 900 square feet, so two does the trick. I also found, that we have way less spiders too, when we have the mothballs under the house. I even put a mothball in the corners of the windows, outside, to keep the spiders from making webs in my windows. When we are faithful about keeping the mothballs out, we have NO spiders and NO mice. I have only seen droppings one time in 19 1/2 years of living here. The only reason we had those, on the back porch, hubby forgot to fill the hole where the freezer drain tube went through the floor. Thanks for the tip, Donita! We've really had lots of tiny spiders this year (which means lots of cobwebs)...so I'm curious to see if this takes care of that problem. Thanks!! Knock on wood, we haven't had any rodents in our house but we sure have spiders! Thank you for sharing your story too. I was laughing so hard!